The Bolshoi Ballet : Raymonda | Que Sera Sara? Last week, I saw the Bolshoi Ballet. Alas, I was not in Moscow, though I’d have loved to see the theatre’s resplendent renovation in person. Instead, I trekked to my local indy cinema (a treasure trove I’ve mentioned before) for a live, HD stream of the night’s production. The Bolshoi have been doing this regularly for a few years now, along with National Theatre in London and the Metropolitan Opera in New York. Audiences all over the world are engaging with these powerhouse Institutions for the first time, and some truly excellent theatre is pushing beyond the boundaries of the proscenium. In principle I’ve always been a fan, yet I’d never attended before. Being an avid live-theatre goer, I’ve always balked. It’s a great substitution, but not the real thing. While I was skeptical of ballet on the big screen (and as you may remember, a less than avid attender of traditional ballet in the first place), I had always wanted to see the Bolshoi. At 5 years old I was convinced I’d be the first ballerina-astronaut double threat (career plans have changed, my love of the eclectic has not). So, off we trotted for a Sunday afternoon (while time zones are often a nuisance, in this instance it was nice to see a 4 hour ballet and still be home for supper). 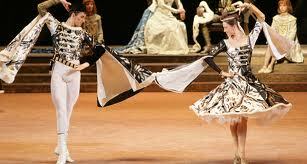 The performance was Raymonda, a traditional Victorian-era ballet of three acts and lots of tutus. The backdrop of the Crusades added extra fun. The eponymous heroine is almost abducted by a Saracen knight whose entourage is a parade foreign stereotypes, complete with fez, scimitars and Asian dance influences. Despite my qualms, the performance yielded many wonderful surprises. Interviews and backstage peeks added allure and interest during the intervals, but by far the best bit was the audience. I was in a cinema full of not-wholly-unexpected OAPs, all polite and subduded, most of them slightly cantankerous (god forbid I should get out of my seat during the break). Many had brought sandwiches wrapped in paper for the interval. It was the traditional, stoic, Arts Attenders which populate many of Edinburgh’s cultural centres. The audience on-screen couldn’t have been more of a contrast. There were vigorous ovations after every dance and every solo. I swear, the prima ballerina probably bowed twenty times before the performance had even ended. Sometimes, after a particularly magnificent leap or lift, raucous cheers would erupt from the crowd. It felt more like watching a rugby match than the ballet. Now I’d love to justify grand sweeping statements about Russian and Scottish theatre audiences, but it was one afternoon. For all I know it was a fluke. Or a badly placed microphone. Or there were a large number of Finns in the audience. But nonetheless, I felt swept up in the excitement and camaraderie of those gleefully vocal audiences two thousand miles away. While ballet can be beautiful or interesting, it’s never been fun before. And now I am curious. These live streamed event seemed like a Good Idea because they helped bring art to audiences who were too far (and with astronomical ticket prices these days, probably too poor) to attend in person. But, clever, clever Bolshoi, I see now it’s more than that. Now I’ve witnessed it from afar, I’ve been seduced by the sheer joy of that theatre. I’m dying to go in person, to cheer and jump along with them. And that is truly world-class audience development. My hat’s off to you sirs, Bravo. The new season begins in September and will include Swan Lake, Don Quixote and Romeo & Juliet. Cinemas and arts venues acros twenty-two countries are hosting productions, so keep your eyes peeled for one in your area. your website is very stylish and modern. and your articles are all informative.